ON THIS DATE (May 6, 1946) ... The Red Sox made it 11 in a row by pasting the St. Louis Browns in a twin bill at Fenway Park. The scores of the double decision were 7 to 5 and 5 to 4. 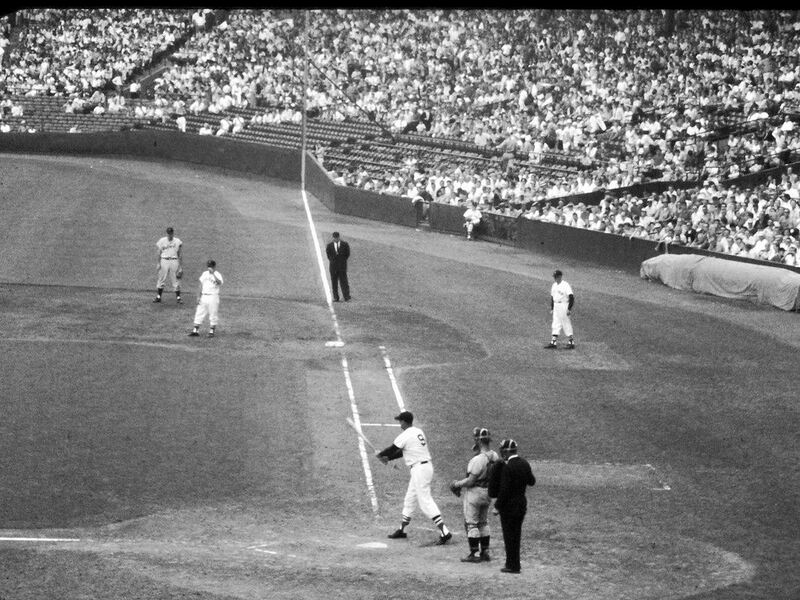 The Sox winning spirit was kept alive in the ninth inning of the second game when Don DiMaggio lashed a whistling single into center field, to bring home Ted Williams with the payoff run. It was a day of near records as the Sox roared to within one triumph of an all time Tom Yawkey owned Fenway contingent for consecutive victories. Johnny Pesky fell one shy of equaling the major league record for successive hits as he became the third big leaguer, in all history, to bash out 11 hits in a row. After Dave Ferriss survived a sloppy start to win his third straight, Joe Dobson pitched up his trousers after he blew a three-run lead to throttle down the dangerous Browns. He hung on gamely until DiMaggio grabbed his place in the spotlight. Ted Williams and Johnny Pesky did more than any of their other teammates to seal a pair of victories. They each collected six hits during the afternoon. Johnny added to his previous seven for seven stretch with four consecutive singles in the opener. And then not knowing that he was in one base hit of an all time record, sacrificed himself for the good of the team in the eighth inning. Starting the second game, Johnny rapped out two more hits and so by the margin of a stride, missed becoming the first big leaguer to wrap all 13 safe hits in a row. 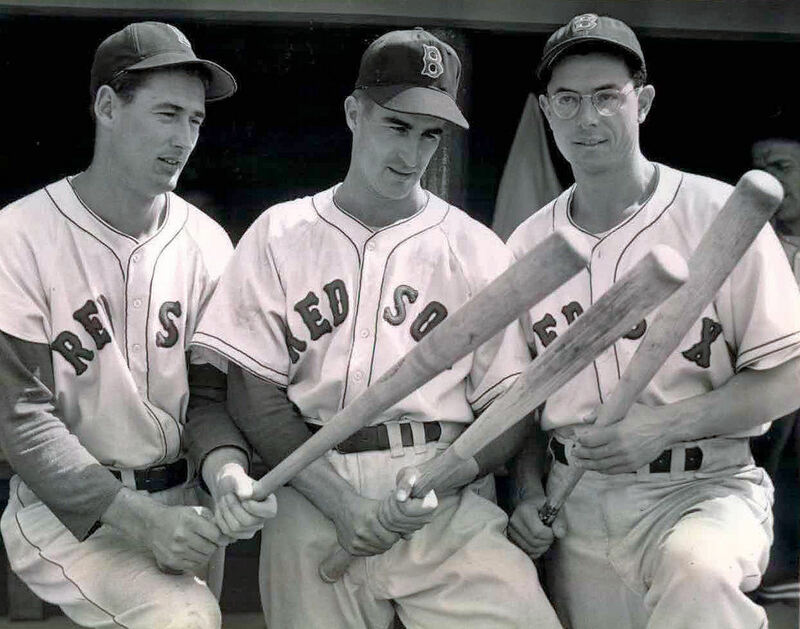 Ted Williams belted his way into a select circle with six hits in seven official tries. He boosted his batting average to a fancy .411 His three hits in the opener were all to left field, as the Browns tried to prevent the Kid from pulling the ball. It was not Ted's battle alone would save Dave Ferriss from disaster in the opener, with two Browns aboard in the third inning, Ted made a spectacular put out by leaping to the top of the scoreboard in the extreme left field corner steel an extra base hit driven by Walt Judnich. One player scored after the catch, but it must have been inspirational to Ferriss, as he settled down five hit, one run pitching thereafter. Down three runs, Pesky's first hit and a Williams double, that barely missed clearing the left-field fence, gave the Sox one back in the opening inning. Down 4 to 2 the Sox exploded with a five-run fifth inning which sewed up the decision for Ferriss. Metkovich and Pesky singled, and Williams pulled a slow outside curve that fell just to the left of the scoreboard for a double to tie up the game. Bobby Doerr slashed a double to right that brought in Williams and Stephens threw away Rudy York's ground ball that led Doerr come home. Don DiMaggio single rescued York with the fifth run of the inning. In the second game the Browns made it necessary for the Sox to come from behind again, as a scored a run off Joe Dobson in the first inning. Johnny Pesky's double down the left-field line gave the Sox their comeback start as Ted followed with a line drive off pitcher Jack Miller's left knee to put Pesky on third. From there Johnny scored on Rudy York's infield out to tie the game. Then Ted Williams open the ninth with a long single, and scooted to second on Bobby Doerr's sacrifice. Rudy York was intentionally passed and DiMaggio's solid smash to center brought the Kid happily home with the winning run.